(1) October is only 31 days long. The writer of Hebrews reminded his readers that church leaders are called to keep watch over people’s souls (Heb. 13:17). Who would have thought that this included more than just laboring in preaching and teaching? It includes hours upon hours of mediation and training and meetings. Not to mention the hours of prayer and anxious reflection. So while your appreciation in the form of a card or a small gift is nice, you might want to remember how much they do for you throughout the year! Ministry is hard and stressful and people often have no clue about the stuff that pastors are dealing with because it’s confidential. Say thank you and show appreciation in May, okay? You should appreciate people who serve in ministry far more than once a year. (2) Senior/Lead pastors don’t do all of the ministry. Every year, there are thousands of senior/lead pastors who receive cards and gifts and other nice tokens of appreciation while tens of thousands of associate pastors, elders, worship leaders, and other pastoral church leaders are totally and completely overlooked. Why? Because they aren’t the “senior” pastor. Never mind the fact that I’m an advocate for the plurality of pastoral leaders (here), no effective pastor is doing it all on their own. He/She has a team of people who are praying alongside of them and who is shouldering a burden that most church members are unaware of. For example, the other pastor of the church I serve is amazing. Don does more than anyone has any clue, except for his wife… and sometimes she probably doesn’t know everything either. Don doesn’t go around letting people know about the ministry and pastoral care he’s involved in. I find out about ways he’s been a blessing to people all of the time after the fact. And yet for years he has stood in the background of Pastor Appreciation Month. Sure, he’ll get an email or a card here and there, but who is thinking about giving him a financial gift or a steak dinner or a vacation? You get my point? Be aware of the fact that ministry is often a thankless job and your gratitude throughout the year to everyone who seres you would be much appreciated! (3) Appreciation from people who make life a living hell. Need I say more? Okay, maybe I should. How about you difficult people keep in mind that your pastor has a difficult job and you can either be a blessing to him or make his life more difficult. I’m not saying don’t avoid allowing him to serve you and to pastor you and to care for you. I’m just saying that constantly complaining about the drum volume or color scheme of the bulletin might seem a little silly when your pastor has spent the last three days trying to help a couple work through a marriage crisis. (4) Appreciation from people who talk about you behind your back. Yes, this is similar to #3, but it’s also unique enough to have it’s own category and since I’m standing on my soap box, I’ll just keep going. If you are going to slander your pastor and totally and completely overlook the biblical process of peacemaking (think Matt. 18:15-20), please don’t give them a gift basking when you are done. Chances are, they already know that you’ve said things about them. Instead of helping your pastor grow or even giving them an opportunity to change, you decided to negatively influence other people towards your pastor and then gave them a gift. I’ll take “Betray the Son of Man with a kiss?” for two hundred! (5) It makes me feel uncomfortable. Maybe that’s a dumb reason, but I often wonder if all this focus on appreciation pastors makes people who are less familiar with church culture a little uneasy. People already think that pastors don’t work much, despite the fact that research shows that pastors work, on average, more than 50 hours a week. Now people probably think that all this focus on appreciating the pastor was probably created by the pastor! Anyway, those are five reasons why I’m not a huge fan of Pastor Appreciation Month. What reasons would you add? Or maybe you are of the opposite opinion and love it! Why? And just so all of the readers know, this is supposed to be thought-provoking. I don’t really hate October or think it’s satanic in origin 🙂 I also realize that not all pastors are serving in positive ways, so don’t think I’m giving people in ministry a blank check either! I have a confession. During Pastor Appreciation Months gone by, I have never thought “Well, we need to appreciate all our pastors, not just kenny [in our case].” But, this last Sunday, I did have that thought. Now, my husband is a former pastor at the Oasis (he’s the sick guy), and it wasn’t him that I was thinking needed appreciation, it was the rest of the crew. I think I thought about this because when Zack got sick, SO many people selflessly pitched in…no pay necessary…and picked up the slack. They deserve appreciation, as does Kenny, yet those acts go unrecognized this month because all the focus is on the head person. I love and appreciate Kenny deeply, I don’t mean to deflect from what he has done and is doing for my family personally and our congregation as a whole…but, I did have that thought. I was sort of afraid to get it out there, but, sounds like I am not the only one. Number three is just hilarious and so sadly true. LOL I have found that I am hesitant to receive gifts from those people. There is always a “but”. “Buts” scare me. Thanks so much for your comments. I think Kenny is such a great guy/pastor that he’d totally agree with you! SOOOOOO many people need to be appreciated more. I want to do a better job of that myself… so thanks for encouraging that strand of thinking. I totally agree with this blog post! 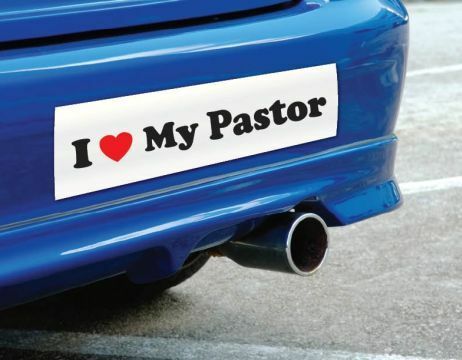 Can I just say this: if we need to devote a month to appreciating pastors, then we need to do the same for doctors, teachers, engineers, mothers, etc. everyone is called to something different. So often, people place pastors on a pedestal like they carry the weight of the world. This isn’t okay. Cast your cares upon He who cares for you. Everyone has hard parts of their job. Most are working hard, and I think it’s messed up to make pastors more important than the rest. We should be taking time out to appreciate one another yes, but the ultimate goal is to spread the word and to follow Gods will. Just my thoughts.